In this major work, published in 1998, James D G Dunn brings together more than two decades of vigorous and creative labour on interpreting the letters of Paul into an integrated, full-scale study of his thought. 800 pages, from T & T Clark. 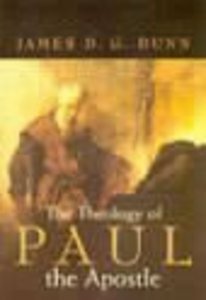 About "The Theology of Paul the Apostle"
James D G Dunn (Ph.D., Cambridge, D.D.) is Lightfoot Professor Emeritus of Divinity in the University of Durham, England. He is the author of numerous books on the New Testament, including several important commentaries on various epistles of Paul, Romans 1-8, Romans 9-16 (Word Biblical Commentary, 2 vols. ), Galatians (Black's New Testament Commentaries), and Colossians and Philemon (New International Greek Testament Commentary) and Christian Liberty: A New Testament Perspective (with Alan M. Suggate), The Justice of God: A Fresh Look at the Old Doctrine of Justification by Faith. His expertise on oral transmission is captured in the two volumes Jesus Remembered: Christianity in the Making, Volume 1 and Beginning from Jerusalem: Christianity in the Making, Volume 2 .